Requirements for serial data testing unique to PCI Express Gen3 place new demands on the traditional physical layer test tools. Not only does the specification mandate that the receiver tester be protocol aware, but certain other characteristics of PCIe Gen3, such as dynamic equalization, essentially require combined physical/protocol layer test capabilities for validation and debug. Only Teledyne LeCroy has the comprehensive set of physical layer, protocol layer, and network analysis tools for complete PCIe Gen3 transmitter, receiver, and channel testing. PCI Express 3.0 Test Suite Requirements for serial data testing unique to PCI Express Gen3 place new demands on the traditional physical layer test tools. Not only does the specification mandate that the receiver tester be protocol aware, but certain other characteristics of PCIe Gen3, such as dynamic equalization, essentially require combined physical/protocol layer test capabilities for validation and debug. 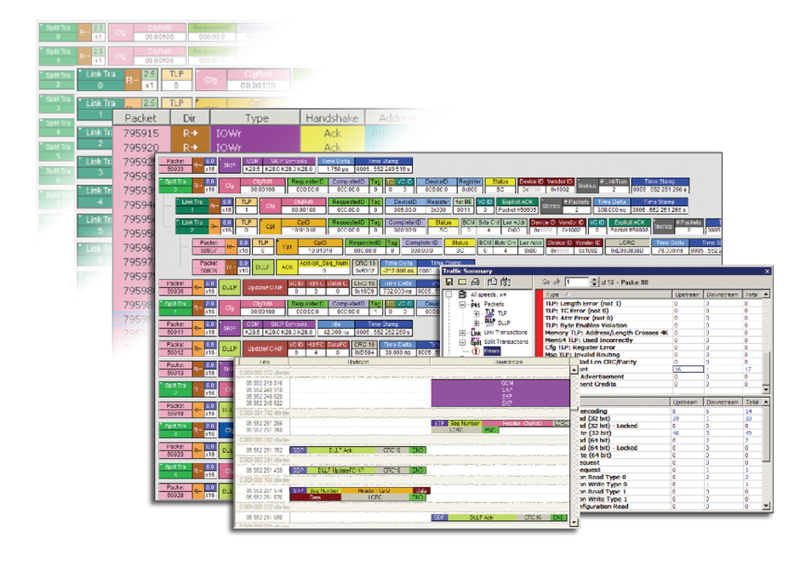 Only Teledyne LeCroy has the comprehensive set of physical layer, protocol layer, and network analysis tools for complete PCIe Gen3 transmitter, receiver, and channel testing. 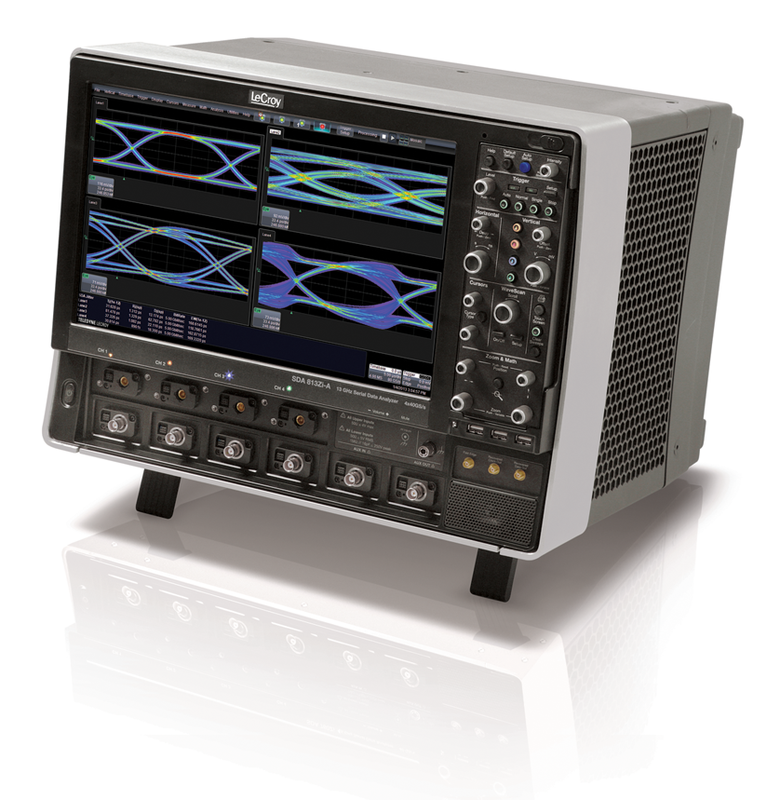 Teledyne LeCroy SDA 8 Zi-A Series of oscilloscopes upgraded to include SDAIII-CompleteLinQ is the perfect instruments for performing PCI Express 3.0 compliance measurements. More importantly, these tools are specially designed for debugging compliance failures, allowing the engineers to quickly find the root cause of serial data problems. 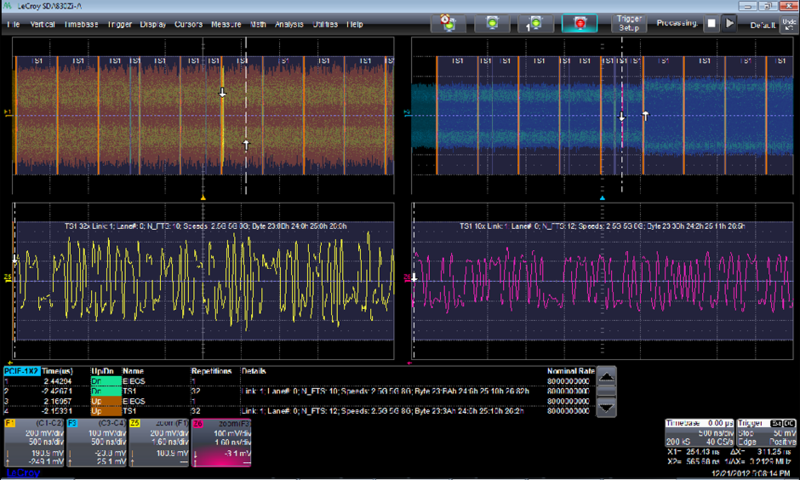 When you add QualiPHY PCI Express 3.0 (QPHY-PCIE3-TX-RX) to the SDA 8 Zi-A oscilloscope, you have the ideal PCI Express 3.0 Compliance Test Instrument. performing these measurements, and provides a comprehensive report of results including screenshots. QPHY-PCIE3-TX-RX uses all of the powerful oscilloscope features to perform the transmitter compliance tests as described by the PCI Express 3.0 specifications. The PeRT3 (Protocol-enabled Receiver and Transmitter Tolerance Tester) fills the space between physical layer test and protocol test, providing a new and more intelligent capability for performance testing of receivers and transmitters. The PeRT3 Phoenix is a new addition to the PeRT3 family of products designed to address PCI Express 3.0 test requirements. 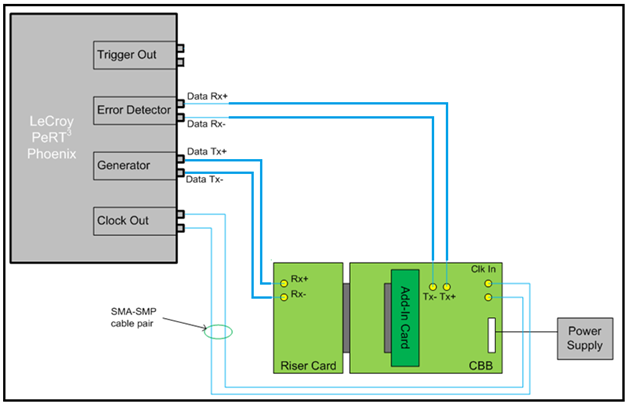 Receiver test specifications require calibration of the jitter output sources for the test instrument. When using the PeRT3 in conjunction with an SDA 8 Zi-A oscilloscope, this calibration process can be fully automated through the QPHY-PCIe3-TX-RX software option. 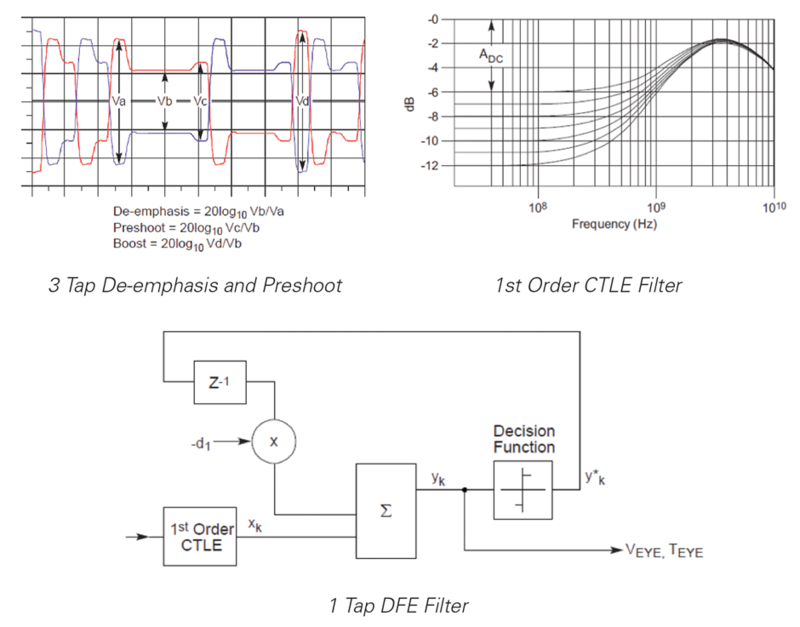 Link equalization as specified in PCI Express 3.0 consists of transmitter equalization through a 3 tap FIR filter and receiver equalization through CTLE and DFE filters. During link equalization training, the 3 tap FIR filter parameters can be recalled by presets or specific cursor values of de-emphasis and preshoot. Then for each setting of TXEQ, the receiver will adjust CTLE and DFE parameters for maximum eye opening. Due to the dynamic nature of the transmission path between endpoint and the root-complex, link equalization training takes place every time a system powers up so a different set of TXEQ and RXEQ value can be selected for different combinations of system boards and add-in cards. The four phases of LTSSM allows for both the root complex and the endpoint to select each other’s ideal TXEQ settings with corresponding RXEQ parameters. The PeRT3 Phoenix establishes PCI Express 3.0 connectivity, and can perform transmitter equalization preset negotiation (satisfying preset response timing requirements) while the receiver optimizes the receiver equalization parameters. 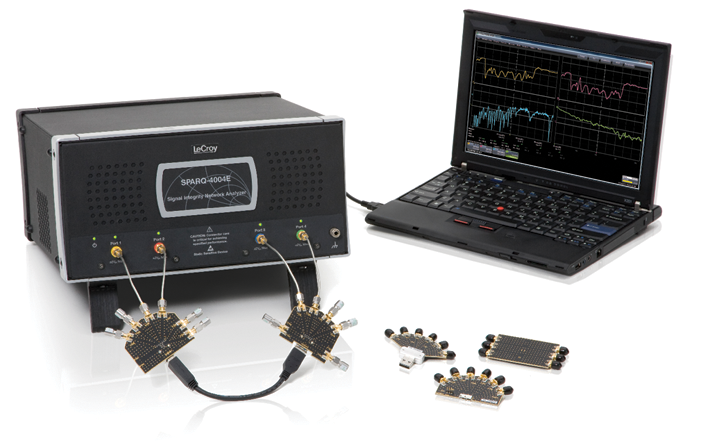 Transmitter, receiver, channel and crosstalk measurements can be made with the Teledyne LeCroy SPARQ Signal Integrity Network Analyzer. SPARQs are TDR/TDT-based analyzers that measure S-parameters with a single button press, and at a fraction of the cost of a VNA. Fully calibrated measurements can be made in minutes, and without any need to connect or disconnect cables to calibration kit standards or electronic calibration modules. The Summit T3-16 is Teledyne LeCroy’s highest performance PCI Express analyzer, and offers advanced features such as: support for PCI Express 3.0; data rates of 2.5 GT/s, 5 GT/s and 8 GT/s; full data capture on bidirectional lane widths of x1, x2, x4, x8 and x16; and 8 GB of trace memory. The product is ideal for high-performance protocol development for add-in boards, servers and workstations, it has clearly become an essential tool for PCI Express 3.0 development.